The practice of yoga teaches us about chakras. Chakras are like balls of energy that, when balanced, allow us to feel healthy and equalized. The seven chakras are also a wonderful way to introduce kids to various yoga poses. Plus, chakras take learning off the mat, as they are helpful in teaching kids about making good choices. Yes, you can accomplish mental and physical workouts when you practice yoga with your kids!! The first chakra is called the Muladhara chakra, or the “root” chakra. The root chakra is located at the base of the spine and is associated with the color red. This chakra is grounding and connects us to the earth, as well as helping us to feel safe and secure. When children feel at “home” or secure they have a solid foundation. That solid foundation can help kids feel safe to explore and try new things, knowing they always can return to “home base”. On the mat, one of the most grounding poses is child’s pose, balasana. Have your young yogi go to all fours on the mat. 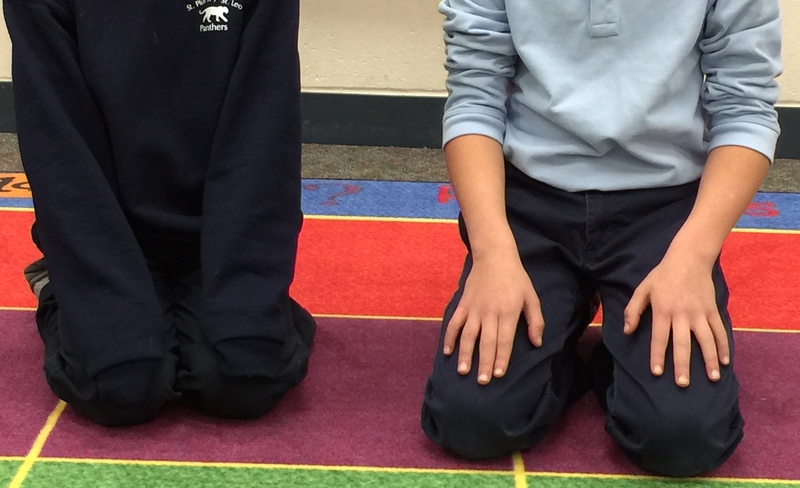 Then ask them to have their big toes touch and set their knees wide. Finally, they settle their bum onto their heels, rest forehead on the floor, and reach arms out in front of them or keep their arms to their side. Child’s pose can be held for a few breaths or a few minutes. 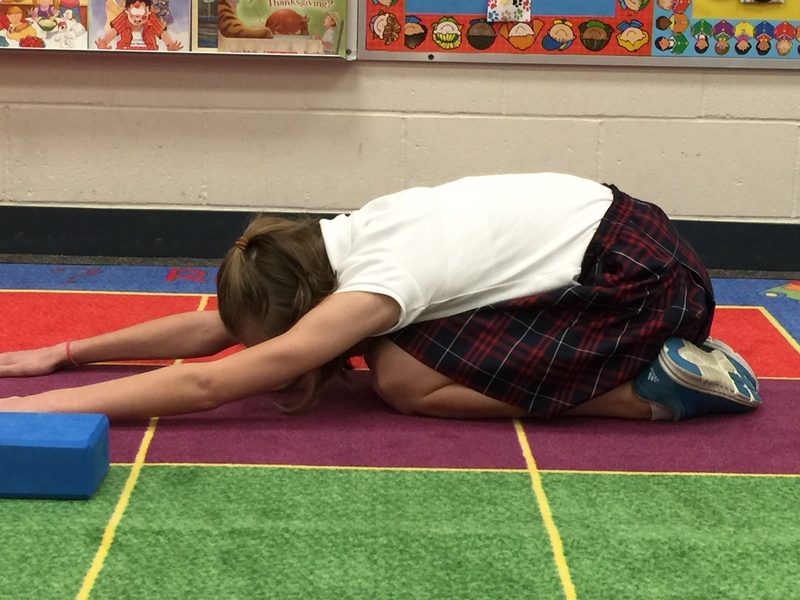 On and off the mat, cultivating a breathing practice can greatly benefit children. Learning some simple pranayama techniques can help a child relax when they are off the mat and facing a scary or stressful situation. On the mat, breath work is a beautiful way to find stillness and settle in. Whenever breath work is practiced, it’s a lovely way to find “home”, become calm, and feel safe. In my classroom and during my kids’ yoga classes, one “go-to” breath practice is called “Take 5”. Simply ask the child to find a comfortable seat in sukasana (criss-cross applesauce) or in hero pose (virasana). The child inhales to a count of five and then exhales to a count of five. The adult can count out loud the first few rounds of breath and then allow the young yogi to find their own pace. All breath is encouraged to be done in and out through the nose, however you can vary the exhales out the mouth. A challenge may be added by asking the child to hold for a count of five after the inhale. “Take 5” breath can be done 5-10 times and with eyes closed or heavy. The gift of the root chakra is that it provides us the base from which to grow. When this chakra is balanced and secure, children can go and explore the world around them secure in the knowledge that “home” is always there to come back to.